Precise Tool & Die, located in Cleveland, Ohio, got its start as a die/mold shop serving the automotive and electrical industries. During its first two decades in business the company saw much success; however, growing international competition forced Precise Tool & Die to evolve. The company gradually shifted its focus from mold making to part production. As it made this change, Precise Tool & Die sought to leverage its expertise in precision machining and existing customer relationships. In doing so, the company aimed to differentiate itself by focusing on quick turnaround production of precision components. To ensure a fluid and balanced transition into the part production market, Precise Tool & Die required a flexible manufacturing system that could provide speed and quality to handle both production and mold applications simultaneously. The company fulfilled this need with an investment in a 24-pallet Makino Machining Complex (MMC2) automated material handling system with two a61 horizontal machining centers. According to Precise Tool & Die, the decision was based on prior experience with Makino equipment, support and training, which it deemed critical for transitioning into a new style of machining capabilities. The Makino flexible manufacturing system has led Precise Tool & Die to labor cost reductions upwards of 40 percent. By applying its precision machining skill set, the company is also achieving tolerances of plus or minus 0.0005 inches. Applications transferred to the a61 cell have seen substantial reductions in the number of required operations, adding to total cycle time reductions between 40 and 60 percent. In some instances, the time between casting arrival and finished part has dropped from one week to just two hours. 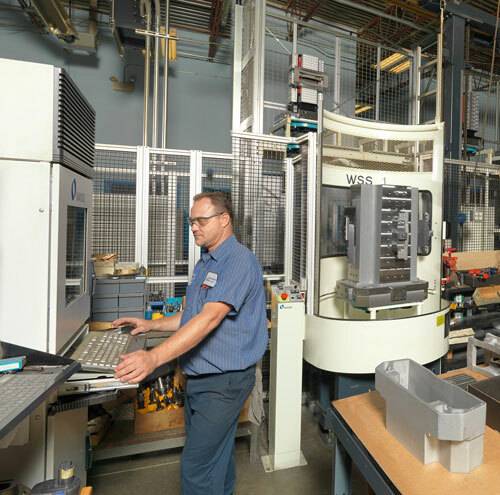 Production applications now comprise nearly 75 percent of Precise Tool & Die’s overall business, and the company is running fully unattended over nights and weekends. Additionally, jobs that Precise Tool & Die once outsourced are now being completed in-house, providing the company with a faster than expected ROI.